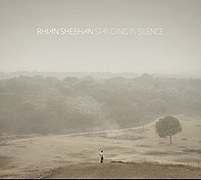 The work of Rhian Sheehan is quite polished, which allows his music's many colors to shine through. On his CD Standing in Silence (47'29") the mood of the tracks shift as if on a whim. Sputtering beats cycle around candy shop chords then give way to electronic elegy and heroic crescendo - imbuing this album with a lustrous charm. Catchy hip riffs fade into the strains of a tearful string ensemble while dancing tones glow and recede. Sheehan is able to play his instruments in a musical way and the results are lovely, beautiful and evocative. But what enhances these engaging moments are the intermittent imaginative soundscapes that pull these earthbound sections into an ethereal realm. Standing in Silence concludes with a set of Ambient pieces, each lingering just long enough to leave the listener in a perfumed sonic atmosphere. Sheehan's music swings a wide arc. From its kinetic sonic reverie to a final sigh of longing, Standing in Silence has charms that are hard to resist.